Given this improved understanding of the history of corrugation and some aspects of the environment in which corrugation developed, we now need to determine whether plain and corrugated vessels would have interacted differently with that environment. Documenting the nature of these interactions involves a process of reverse engineering in which I use experiments and other pertinent data to measure relevant aspects of cost and performance of plain and corrugated vessels. Choosing the aspects of cost and performance to measure is based on knowledge of the environment with which the vessels interacted. Changes in the production and use environments documented in Chapter 6 indicate that differences between plain and corrugated vessels in manufacture costs, heating effectiveness, ease of handling, and use-life are likely to be relevant to explaining the development and spread of corrugation. In addition, other archaeologists have made claims about the relevance of these features based upon their own experiments and attempts to explain corrugation (e.g., Beals et al. 1945; Blinman 1993; Gumerman 1984; McGregor 1941; Schiffer et al. 1994). Certainly other cost and performance properties could be measured. However, practical limitations usually result in a trade-off between thorough measurement of a few properties and cursory measurement of many. In choosing a few properties to measure, I hope to generate enough well controlled experimental data to offer strongly warranted conclusions about the relative costs and benefits of plain and corrugated vessels at least in terms of these four variables. This chapter is organized into five sections. In the first section, I describe the how the replica vessels were produced for use in the various experiments and provide information on the characteristics of each vessel. This is followed by sections covering the each of the four features under investigation: manufacture costs, heating effectiveness, ease of handling, and use-life. In each section, I present the procedures and results of my various experiments and discuss additional data relevant to the issue such as results of experiments performed by other investigators, knowledge drawn from engineering and material sciences, and data from ancient pottery assemblages. To perform these experiments, I needed to manufacture and use accurate replicas of the ancient cooking pots. These are not meant to be exact copies of particular ancient pots, but replicas that are accurate with regard to the particular features relevant to this study including construction technique, raw material, and size. A total of 24 vessels, 12 plain and 12 corrugated, were made and individually numbered (1-24). In designing these replicas, I wanted to hold everything constant except those aspects of forming techniques that differentiate the ancient plain and corrugated pots. Thus, all pots were made from the same batch of raw materials, in the same size and shape (to the extent possible with hand-made items), formed by the same person, and fired together in the same kiln. The raw materials consist of clay from a Dakota Formation exposure along a road cut in the Cortez Industrial Park (designated as industrial park gray or IPG), which was mixed with 15 percent by volume of crushed igneous rock obtained from the back dirt of a rock crusher located in McElmo Canyon at the northern end of Ute Mountain. I processed the clay by grinding the raw chunks to a fine powder, and then mixing the clay powder with temper and water. The temper was cleaned and sorted by washing it through a set of nested sieves and consisted of equal amounts of material from two size classes, 1.4-.71 mm and .71-.25 mm. No other processing occurred with the temper before being mixed with the dry clay. The dry clay-temper mixture was then combined with normal Montezuma County tap water until saturated, and allowed to age for one week before the vessels were formed. The moistened clay/temper mixture was divided into 800-g portions for making each vessel. When the vessel was complete, the remaining clay was weighed to determine the weight of moist clay used to construct each vessel. During forming of the replicas, their size and shape were controlled by constant matching with a template designed to yield a finished, fired vessel that is 15 cm high with a globular, wide-mouthed, slightly flaring jar form (Figures 28 and 29). I selected this form because it matches the shape of late neck-banded and early corrugated vessels from the Mesa Verde region. Although small by ancient gray ware standards, the size fits within the lower range of those actually used for cooking in the Mesa Verde region. The template is slightly larger than the finished product because approximately 8-10 percent shrinkage occurs during drying and firing. Clint Swink, an experienced replicator of ancient pueblo pottery, formed all of the vessels. Because the replicas were made by hand, they differ somewhat from the ideal template form. Table 15 presents measurements made on each vessel after firing and before use experiments began. Although most variation in the replicas is random, the corrugated vessels tend to weigh a little more than the plain vessels as a result of slightly greater wall thickness particularly at the base. Figure 28. Examples of fired plain replica vessels used in experiments. Figure 29. Examples of fired full-body corrugated replica vessels used in experiments. Table 15. Measurements on replica utility ware vessels used in experiments. 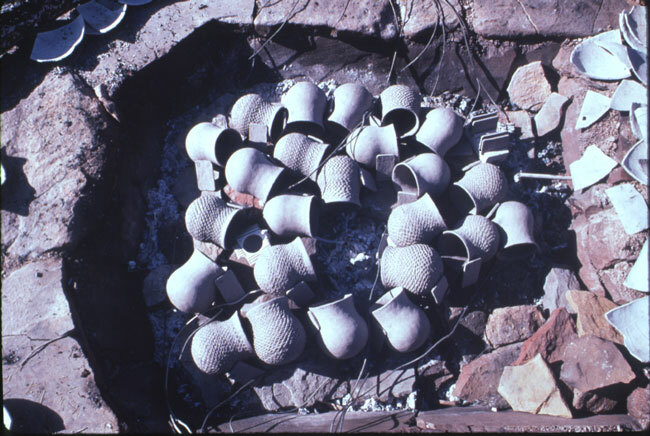 The replicas were dried in a conventional oven overnight at 65 ¡C, and fired the next day in a replica of an ancient Mesa Verde region trench kiln using techniques developed to successfully fire organic painted black-on-white pottery ( Swink 1993). After burning down pinyon and juniper wood to create a bed of coals in the bottom of the kiln, a layer of tabular sandstone rocks was added. We then arranged the 24 replicas systematically on top of these rocks so that plain and corrugated vessels were evenly distributed around the kiln. Next to each pot we placed a 6 by 10-cm tile made from the same raw material. Sixteen type k thermocouple probes were then placed around the vessels (Figures 30 and 31). The layer of vessels was covered with a second layer of pinyon and juniper fuel, which was then ignited from the top. Within 30 to 40 minutes after lighting of the secondary fuel layer, temperatures throughout the kiln had stabilized at about 800 ¡C (Figure 32). The pots were exposed to this peak temperature for another 40 minutes, and then the entire kiln was smothered with earth and allowed to cool over night. Although the temperatures within the kiln were fairly consistent during the firing, the atmosphere varied slightly with some vessels showing slightly more oxidation or reduction than others. Figure 30. The placement of pots, tiles, and thermocouple probes in kiln before firing. Figure 31. Sketch map of the arrangement of vessels and thermocouple probes in the kiln used to fire the replica vessels. Numbers on vessels are vessel numbers and number next to dots are TC probe numbers corresponding to Figure 32. Figure 32. Temperature profiles for pit kiln firing of replica utility ware vessels used in experiments. I designed the plain and corrugated replicas to differ in construction based on knowledge gained from the analysis of the gray ware assemblages discussed in Chapter 5. The plain vessels are replicas of the earliest cooking pots referred to as Chapin Gray (Figure 28). This variety of early gray ware vessel was made using relatively large coils or slabs which were filleted or stacked on top of one-another to build up the vessel wall and both surfaces were scraped smooth to weld coils together and form the finished shape. To mimic this, the plain surface replicas were made by first forming a small disk in a base mold or puki to serve as the base of the pot and then adding two or three large coils which were pinched up and scraped to form the 5 mm thick wall. The corrugated replicas were designed to match the early corrugated vessels produced in the 11th century AD (Figure 29). The average values for amount of coil overlap (60 percent), spacing of indentations (11 mm), and exposed coil height (6 mm), and wall thickness (5.5 mm) obtained from the two corrugated assemblages analyzed were used to guide forming of the corrugated pots. The application of coils involved placing the coil on the pot, indenting the coil between the index and middle fingers, and then creating a platform at the top of this coil for placing the next coil. This procedure was repeated until the desired height and form of the vessel was obtained. Manufacturing costs for plain and corrugated vessels could have varied in the amount of time required to form the vessels and through differential failure rates during production. Regarding forming costs, archaeologists and potters have generally assumed that corrugated pottery is more technically demanding and consequently more costly to produce (e.g., Gifford 1978; Shepard 1939:279). However, Blinman (1993) argues, based on his as yet undocumented replication experiments of plain and corrugated pottery, that corrugation is less costly to make in that it takes about 1/3 the amount of time to form a vessel using this technique as a scraped plain vessel of a similar size and shape. Although the impact of production failures on manufacture costs of plain and corrugated pottery has rarely been considered, some have argued that leaving coils exposed may affect the strength of the weld between coils and the frequency of structural failures during drying and firing ( Blinman 1993; Schiffer et al. 1994). Still others have suggested that the use of overlapping and indenting of coils may have strengthened coil welds ( Beals et al. 1945:140). These issues were either not addressed or left unresolved by earlier experiments. To measure differences in costs accrued during the forming stage of manufacture, the time required to form each of the 24 replica vessels prepared for this study was recorded. Only forming time was recorded because variation in clay preparation and drying times depend on several factors most of which are irrelevant to this study. As described in more detail above, the 12 plain vessels were formed using wide, filleted coils that were scraped on both surfaces to obtain a specified morphology and help weld the contacts between adjacent coils. The 12 corrugated jars were manufactured entirely of small, overlapping, and indented coils, which were scraped smooth on the inside surface. All vessels were made to the same size and shape specifications although some variation exists among individual vessels. Two factors can significantly affect the validity and reliability of these forming time measurements. First, the values are useful only if the replicator is proficient in forming the vessels and enough vessels have been formed at a proficient level to yield an accurate estimate of forming time. Comparing vessel-forming times over the sequence of construction episodes from the first vessel to the last can be used to assess replicator proficiency. At the outset, forming times may be high, but as the potter's proficiency improves, forming times should decrease until maximum proficiency is attained and forming times stabilize with only small random fluctuations. It is only after the values have stabilized that forming time measurements are useful for estimating manufacture costs. Figure 33 shows the sequence of forming times for the plain and corrugated vessels manufactured for this study. Both sets show a slight trend toward decreased forming time through the entire sequence of 12 vessels, but values are more stable after 2 plain and 3 corrugated vessels were manufactured. In neither case is there a large decrease in forming times. This may result from the considerable experience Clint Swink, the potter, had with forming plain and corrugated vessels before the experiment began. In fact, it is possible that both sequences show mostly random fluctuations. Figure 33. Vessel forming times by sequence of construction for the 12 plain and 12 corrugated replicas. Second, the validity of forming time measurements requires that the techniques employed to form the vessels match as closely as possible those used by the ancient potters. The techniques used for forming the plain and corrugated replicas for this study were selected after examination of forming traces in the pottery analyzed from the six Mesa Verde region assemblages (see Chapter 5) and experimenting with techniques to produce pottery with the same characteristics. However, it is possible that multiple techniques can produce the same results, and that the techniques employed to make the replicas differ from those used by the ancient Pueblo potters. Although more detailed observations of the ancient pottery can improve our understanding of construction techniques, it is likely that we will never know with certainty what set of techniques were actually used in the past. Given that the best we can say about the forming techniques employed for this study is that they are reasonable approximations of those used in the past, we will need to be cautious in using the forming time results to measure manufacture costs. These forming time experiments produced the opposite result of Blinman's (1993) replication experiments. In the experiments performed for this study, corrugated pots took an average of three times longer to form than the plain vessels (Figure 34) rather the than one third less time suggested by Blinman. This fairly major difference probably results from the use of different forming techniques although it is difficult to say with certainty without knowing more details of Blinman's experiments. The large differences in forming times between the plain and corrugated vessels made for this study probably derive mainly from differences in coil size and application technique. If the same number of coils and degree of overlap were used to manufacture both plain and corrugated vessels, it is possible that forming times would be similar or that corrugated vessels could even take less time to form because the scraping step would be eliminated. However, the use of a small number of wide, filleted coils in the plain versus the numerous smaller, overlapping coils in the corrugated should, and experimentally did, result in less time to form the plain vessels. If coil size and application are the main determinants of forming time variation, then forming costs would have increased during the tenth and eleventh centuries as coils size decreased and overlapping applications increased. Figure 34. Box plot of time needed to form replicas of plain and corrugated vessels after forming times stabilized. Failure of vessels during manufacture is most likely to occur during the drying and firing stages because of the shrinkage of the clay body that occurs during each of these steps. After both drying and firing the replicas, I visually examined each of the 24 vessels made for this study for the development of any flaws or failures. No flaws were detected after drying, but two vessels, both with plain surfaces, developed cracks during firing. One vessel (no. 21) sustained a rim crack that extended 2.7 cm down from the rim while the other vessel (no. 18) developed a 3.6-cm long crack parallel to the rim at the base of the neck. Although water leaked from both of these cracks, neither compromised the use of the vessel nor did the cracks expand during use. In various pottery replication and firing experiments performed over the past few years, some of us have also noted that in vessels with corrugated necks, cracks propagating down from the rim tend to stop at the first exposed coil junction below the rim. Based on these various anecdotal observations, it appears possible that corrugated vessels are slightly more resistant to the stresses generated during manufacture, and thus may fail less often. However, it is unclear whether the difference is sufficiently great to affect production costs. Superior performance of corrugated pottery during use could offset its higher manufacture cost. Because the change to corrugation occurred when gray ware pottery was used mainly for cooking (see Chapter 6), differences between plain and corrugated vessels in the transfer of heat through the vessel wall and the effects of these differences on the contents being cooked constitute the relevant measures of performance. For many years, archaeologists have asserted that the greater exterior surface area of corrugated vessels would have resulted in more effective heat transfer between the heat source and the vessel contents, and that this difference may have played a significant role in the adoption of corrugation ( Gumerman 1984:79-80; McGregor 1941; Rice 1987:232; Vivian 1990). However, recent experiments by Plog (1986), Schiffer (1990), and Young and Stone (1990) designed to measure the effects of various surface treatments, including exterior surface texturing, on heating effectiveness suggest that corrugation does not necessarily improve performance, and can even degrade it. Although intriguing, these experiments have not been convincing to all observers mainly because of problems seen with the design of the experiments. For example, the vessels used were not accurate replicas in terms of the raw materials, forming techniques, vessel morphology, or firing regimes employed, and the number of tests, or experimental runs, was extremely low. To more thoroughly evaluate the heating effectiveness of plain and corrugated gray ware pottery, I used the 24 replicas described earlier in cooking experiments which were designed to assess the impacts of three factors-exterior surface treatment, interior surface lining, and cooking contents. Each factor consists of two states. Exterior surface treatment includes scraped plain and corrugated. Interior surfaces are either unlined or lined with pinyon pitch. I chose to study the effects of interior surface lining because previous experiments had shown that reducing vessel wall permeability through lining can affect heat transfer effectiveness ( Schiffer 1990). Although there is no record of ancient Pueblo pottery being lined with pitch, this is a common practice with ceramic cooking pots in other parts of the world. In addition, I thought that pitch was probably one of the most effective lining materials available to ancient Pueblo potters, and I wanted to test the most extreme case. This assumption proved incorrect as I discuss in more detail below. The contents of vessels varied by filling some with 700 ml of plain tap water and others with 700 ml of corn mush created from 600 ml of tap water mixed with 100 ml of chicken stock and 15 ml of corn meal. I included chicken stock to add fat to the contents and to simulate the addition of turkey or other meat to corn-based recipes. The three factors with two states each produce eight possible factor combinations (Table 16). With 24 vessels, three vessels can represent each factor combination. I randomly selected which vessels would be assigned to each factor combination. Table 16. Vessel numbers assigned to different factor combinations for experiments. The experiment involved heating each filled pot on a propane burner set at about 450 ¡C, and measuring the time elapsed before a peak temperature was reached, which was boiling (~95 ¡C because of high elevation) in most cases. Before filling the pots for each run of the experiment, they were weighed to the nearest 1/100th of a gram. After weighing, the pots were placed on the burners, and filled with the appropriate contents. Working rapidly, we then arranged all of the temperature probes and began logging temperature data. Temperatures were measured by placing the tips of stiff, submersible, type k thermocouples probes against the exterior surface of the vessel at three points (base, middle body, and neck) and one probe inserted into the contents of the vessel one cm above the base of the pot (Figure 35). After initiation of temperature recording, the burners were ignited and adjusted to the appropriate level. I selected 450 ¡C as the target flame temperature because open wood fires can easily reach that temperature. However, it was often difficult to set and hold the temperatures of the propane burners resulting in temperatures at the base of the pots fluctuating between 400 ¡C and 500 ¡C. This range is still well within that of open wood fires. The time elapsed between filling the pots and igniting the burners was usually less than 3 minutes. The filled pots were heated for 40 minutes and then allowed to cool for 20 minutes, recording temperatures for the entire hour. After the cool down period, I emptied the vessel contents into a graduate beaker to measure remaining volume, the interior surface was rapidly wiped with paper towel, and the pot was weighed again to the nearest 1/100 of a gram. The temperature data for each vessel were logged every ten seconds by computer for each experimental run. In addition to the temperature data, we also recorded observations of vessel performance during heating and cooling, such as boilovers, leaks, etc., and noted any alterations to the vessel surfaces and vessel integrity after the experiment. We repeated this experiment 12 times for each vessel resulting in 36 measurements for each factor combination. 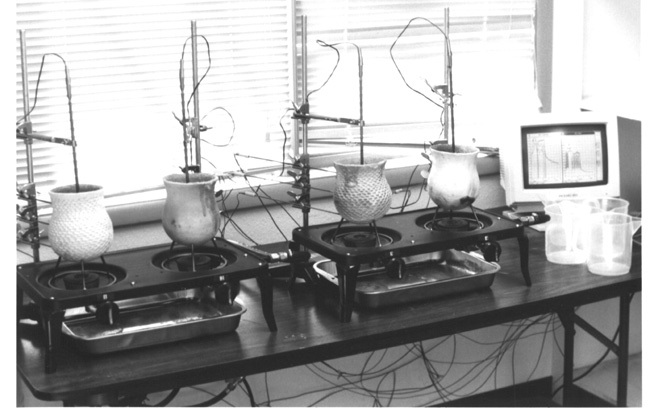 Because four burners were used in each run of this experiment, the pots were rotated to a new burner for each run so that each pot was heated three times on each burner. In addition, four plain and four corrugated vessels containing corn mush were used in numerous additional cooking runs as part of the use-life experiments discussed below. Data on heating effectiveness generated during these use-life experiments are incorporated into this evaluation of heating effectiveness when appropriate. Figure 35. Arrangement of vessels and temperature probes used to perform heating effectiveness and use-life experiments. In addition to performing the cooking experiments, I measured the permeability of the wall of each pot before the first experimental run and after run numbers 4, 8, and 12 for of each vessel. This was done by weighing the dry pot to the nearest 1/100 of a gram, and then filling the pot to the rim with tap water and letting the water soak into the vessel wall for 60 seconds. The water was then emptied and the inside surface wiped rapidly with a paper towel to remove any liquid remaining on the vessel surface. The empty pot was then weighed again to the nearest 1/100 of a gram. The difference between the two weights is a measure of the amount of water absorbed into the vessel wall during the soak period and thus reflects the permeability of the inside surface. Box and whiskers plots of the time required for vessel contents to reach peak temperature for each of the eight factor combinations (Figure 36) show considerable variation among vessels containing only water, and remarkable similarity among vessels cooking corn mush. Among both the plain and corrugated vessels containing water, the unlined vessels took longer to reach peak temperature than the vessels lined with pitch, and the unlined corrugated vessels were by far the least effective at heating the water. In addition to taking longer to heat, water in unlined corrugated vessels frequently failed to boil in the 40 minutes of heating time during each experimental run (Figure 37). In contrast, no significant difference (p<.001) exists in the time required to reach peak temperature among the lined and unlined, plain and corrugated vessels in which we cooked corn mush, and the contents boiled vigorously in all cases. Figure 36. Box plots of time elapsed before reaching peak temperature for multiple runs with vessels in each of the eight experimental factor combinations (C=corrugated, P=plain, L=lined, U=unlined, W=water contents, M=mush contents). N = number of runs. Figure 37. Box plots of peak temperature for multiple runs with vessels in each of the eight experimental factor combinations (see Figure 36 caption for factor combination definitions). N = number of runs. These results support and extend those obtained by Young and Stone (1990) and Schiffer (1990). Reducing vessel wall permeability, either by applying a sealant before use or through cooking food, which is absorbed into and clogs pores in the vessel wall, greatly enhances heating effectiveness. Figure 38 shows the relationship between wall permeability (amount of absorbed water) and heating effectiveness (time to reach peak temperature) for plain and corrugated vessels. Each point in Figure 38 represents data for an individual vessel averaged from all measurements made after the first run. I excluded data from the first run because wall permeability frequently changed notably after that run, a phenomenon I address separately below. Figure 38 indicates that a strong, negative, relationship exists between heating effectiveness and wall permeability, and that the nature of this relationship differs between plain and corrugated vessels. For a given increase in vessel wall permeability, heating effectiveness degrades at a substantially greater rate for corrugated than for plain vessels. This difference is a function of the greater exterior surface area of corrugated vessels. As liquid soaking through the vessel wall reaches the exterior surface, it evaporates. The heat energy used in this change from liquid to gas phase results in cooling of the vessel and its contents. The extended surface of corrugated vessels increases the rate of evaporative cooling producing a greater degradation of heating effectiveness than in plain surfaced vessels. Figure 38. Scatter plot of heating effectiveness and vessel wall permeability. Points represent average values for individual vessels derived from multiple experimental runs. Another difference in the permeability-heating effectiveness relationship between the two vessel forms is that the association is linear for plain vessels and slightly curvilinear for corrugated vessels. This difference derives from the degradation of the pitch lining over experimental runs (see Figure 39). The time needed to reach peak temperature in the lined vessels heat water increased gradually during the course of the experiment. This is due to the loss of some pitch during each run making the vessel walls more permeable. Given the different responses to wall permeability between plain and corrugated vessels, the lined corrugated vessels heating water lost heating effectiveness more rapidly than the comparable plain vessels. This produced the curvilinear relationship for corrugated vessels. I suspect that the relationship would be linear if another, more stable, method of controlling wall permeability was used. Figure 39. Changes in heating effectiveness over experimental runs for different factor combinations. Changes in the time required to reach peak temperature over the course of experimental runs, shown for different factor combinations in Figure 39, also expose important patterns in the relationship between wall permeability and heating effectiveness. In the first runs of each set, the contents (regardless of composition, water or mush) of corrugated vessels lined with pitch reached peak temperature more rapidly than in the pitch-lined plain vessels, while among unlined pots, the plain vessels heated their contents more rapidly. Degradation of the pitch lining through use resulted in a loss of heating effectiveness particularly for corrugated vessels heating water as discussed above. For the lined vessels cooking mush, heating effectiveness diminished after the first run, but then stabilized as the mush permeated and lined the vessel walls. Among the unlined vessels, the time to reach peak temperature in those heating water fluctuated randomly with the corrugated vessels consistently proving less effective than the plain vessels. For the unlined vessels cooking mush, the initial run required more time to reach peak temperature than subsequent runs. The heating effectiveness of these unlined vessels improved as the mush soaked into the vessel walls. Very small, yet consistent, differences in heating effectiveness between plain and corrugated vessels can be seen after the first run, with plain vessels remaining slightly more effective than corrugated vessels. These results further reinforce the importance of vessel wall permeability to heating effectiveness. The slightly elevated effectiveness of pitch-lined corrugated vessels over pitch-lined plain vessels in the first run when wall permeability was extremely low indicates that the greater exterior surface area of corrugated vessels does improve the transfer heat to the vessel contents. However, even slight increases in wall permeability eliminate this advantage because the area of the surface losing heat through evaporative cooling is considerably greater than the small portion of the vessel, the base, actually being heated during use. The fact that a single episode of cooking food greatly reduces the permeability of an unlined vessel wall suggests that users of plain and corrugated pottery in the past would probably have been unaware of their significant differences in heating effectiveness when unlined. In addition to heat transfer, the control of temperatures so that the contents cook but do not boil over has been shown ethnographically to be an important aspect of cooking pot performance, and can even supersede heat transfer effectiveness ( Skibo 1994). During most of the heating effectiveness and use-life cooking experimental runs, we monitored the occurrence and intensity (heavy or slight) of boilover episodes. No boilovers occurred in the vessels containing only water, but boilovers were common in the vessels cooking corn mush because the starch in the corn meal tends to froth when it boils. For the cook, heavy boilovers present a problem because they can douse the cooking fire and waste food whereas slight boilovers waste little and usually evaporate before reaching the fire. Out of the 140 experimental runs of plain and corrugated vessels cooking mush for which boilovers were recorded, heavy boilovers occurred in 48 percent of plain vessel runs and only 24 percent of corrugated vessel runs. I suspect that this pronounced difference in the rate of heavy boilovers probably results from the slightly lower heat transfer effectiveness of corrugated vessels cooking mush documented earlier. The greater evaporative cooling of corrugated vessels may have allowed improved control of cooking by slight reductions in the rate and intensity of boiling. If simmering or other more controlled forms of moist cooking were preferred to boiling, corrugated vessels would have offered an important benefit. Because the exposed coils on the upper portion of the vessel body produce this effect, later neck-banded and neck-corrugated vessels probably also offered an advantage over scraped plain vessels in cooking control. Although boilovers can be avoided by other means such as using larger or more open vessels to cook the same amount of food, these adjustments introduce additional costs. Larger vessels involve greater manufacture costs whereas more open vessels lower heating effectiveness by allowing more heat loss from the opening of the vessel. How these costs compare to the higher cost of forming corrugated vessels has not been documented. Ease of handling constitutes another frequently discussed area of possible performance differences between plain and corrugated vessels ( Blinman 1993; Schiffer et al. 1994). Many argue that the corrugated surface is superior for handling because the rough surface provides more friction, which would reduce the number of accidental drops resulting in breakage of the vessel. Although I did not conduct any experiments designed explicitly to generate data on potential handling differences between plain and corrugated vessels, I did handle the vessels quite a lot during the cooking experiments and teaching which resulted in some anecdotal observations regarding ease of handling. Out of the nearly 2,000 times I transported the plain and corrugated replicas used in the heating effectiveness and use-life experiments, I dropped only one vessel. This was a plain-surfaced vessel that slipped out of my hand when I was setting it down while teaching a class after the experiments were completed. Both the relatively small sizes of the replica vessels and the extreme care I exercised when transporting the vessels probably contributed to the low droppage rate. Larger vessels (which are more common in actual gray ware assemblages) are heavier, and offer a broader surface for grasping which could have produced a higher droppage rate in the past. In addition, while handling the vessels after cooking, I frequently noted that the corrugated vessels were easier to handle hot than the plain vessels because less of the hot surface was in contact with my hands. Based only on these anecdotal observations, it appears that a corrugated surface does offer some handling advantages, particularly when the vessels are hot, and probably the rougher the surface the better. Thus, the earliest forms of exposed coils, which were relatively wide and flat, would have offered little handling advantage over a plain surface. The introduction of overlapped coils resulting in a clapboard-like surface would have added considerably to surface roughness and perhaps improved handling. The later addition of indentations to the overlapped coils also increased surface roughness and greatly reduced the amount of vessel surface coming into contact with hands grasping the vessels. The amount of use obtained from a pot before physical failure or degraded performance requires replacement affects the cost of vessel technologies. The longer a vessel lasts during use, the lower the production costs as fewer vessels need to be manufactured per unit of work performed. For many years, the prevailing view has been that plain surfaced pots are stronger than corrugated pots, and consequently may have had longer use-lives. This perspective derives from the reasoning of both potters and engineers. From the potter's perspective, experience has shown that the worst thing you can do when hand-building pottery from coils or slabs is to inadequately weld the junctions or joins between construction elements. Poorly joined coils constitute zones of weakness in the vessel wall that can crack more easily during drying, firing, and use. From the engineer's perspective, unevenness or discontinuities in the vessel wall produce areas of stress and strain concentration during mechanical or thermal stress loading ( Manson 1966:250-253, 385-391; Smith and Smith 1960; Stokes 1968). Not only does stress tend to concentrate in the weakest area such as poorly joined coils, but the variation in thermal inertia created by adjacent zones of thin and thick wall can result in stress inducing temperature, and thus, thermal expansion differentials within the vessel wall. However, recent experiments by Schiffer and others (1994) suggest that ceramic vessels with deeply textured exterior surfaces may be less susceptible to failure (cracking and surface spalling) due to thermal stress than vessels with plain exterior surfaces. In addition, Heidke and Elson (1988) and Weigand (1976) make a similar argument for the highly textured stucco-coated pottery found in Hohokam sites and produced historically by the Huichol Indians of northern Mexico. Although both experimental and ethnographic evidence suggests that exterior surface texturing may improve the use-life of cooking pots, no clear or convincing argument has been presented regarding the physical mechanisms involved. Consequently, it is appropriate to review current knowledge regarding the nature of potential stresses and strains generated in ceramic cooking pots during use. Two kinds of stress-mechanical and thermal-operate to produce strains within the wall of a ceramic cooking pot that can result in failure and significant performance degradation. Mechanical stress occurs when force is applied to the vessel through contact with another massive substance, usually a solid. The nature of the mechanical force(s) applied (whether static or dynamic, and their magnitude and direction) and the materials and forms involved determine, to a great extent, the nature of the resulting stresses and strains. Thermal stresses arise from temperature effects. Temperature gradients and differential expansion of distinct materials exposed to the same heat within the vessel wall can produce stresses if some force constrains thermal expansion. This thermal stress can cause weakening and failure of the vessel wall through the initiation and propagation of cracks. As with mechanical stress, the nature of the temperature distributions in the vessel wall, and the composition and form of the vessel govern the thermal stresses and strains that develop. Mechanical stresses normally generated during the use of ceramics pots for cooking include the more or less static forces exerted on the vessel wall by the contents of the vessel, and the dynamic forces of impact and abrasion. Thermal stresses arise from transient temperature changes experienced in the vessel wall during heating and cooling, from the temperature gradient that exists between different portions of the vessel (For example, the difference between the heated exterior surface and the interior surface which is cooled by contact with a liquid. ), and from the differential thermal expansion of clay and temper constituents of the vessel. At a minimum, a useful ceramic vessel must be able to withstand the normal mechanical and thermal stresses of manufacture and use without catastrophic failure. Several studies have documented how a variety of compositional and formal design characteristics of traditional ceramic cooking pots improve resistance to stresses by raising the critical level of stress needed to induce catastrophic failure ( Bronitsky and Hamer 1986; Feathers 1990; Feathers and Scott 1989; Rye 1976; Schiffer et al. 1994; Skibo et al. 1989; Steponaitis 1984; Wallace 1989; West 1992). However, repeated exposure to subcritical stresses causes fatigue which can eventually result in structural failure or significantly degraded performance of ceramic cooking pots. Thus, any aspects of vessel design that reduce stress or enhance stress resistance will increase the probability of longer use-life by raising the critical stress levels and reducing fatigue. On the other hand, aspects of design that produce local concentrations of stress and zones of weakness will probably decrease use-life. Differential effects of given aspects of vessel design in the face of various kinds of stresses and strains create the possibility for design trade-offs. Consequently, we should consider the case of stresses generated during cooking in a little more detail. Cooking involves few and usually weak mechanical stresses such as those generated by the pressure of the contents, by impacts from stirring and serving utensils, by moving the vessel onto and off the fire, and perhaps by cleaning. Any vessel that survives forming and firing will probably be able to withstand these stresses. Strong mechanical stresses such as those that occur during impact from dropping a vessel will frequently result in failure of the vessel because of the brittle nature of ceramics. However, vessels with thick walls will fail less frequently than vessels with thin or variable thickness walls. In addition to design adjustments, behavior can also be modified to reduce the frequency and force of mechanical stresses. In contrast, ceramic cooking pots experience considerable, constant thermal stress during use. From the moment a pot is first placed on the fire until it has cooled after removal from the heat, a thermal gradient exists between the heated exterior surface and other cooler parts of the vessel. If the vessel is used to cook a liquid, the temperature of the interior surface will not exceed by much the boiling temperature of the liquid. The temperature of the heated portion of the exterior surface can be substantially higher depending on the temperature and configuration of the heat source. With a vessel sitting directly on a normal wood fire, the temperature difference between exterior and interior surfaces at the base of the pot can easily range between 300 and 600 ¡C. The thermal gradient produced by this temperature difference results in greater thermal expansion of the heated exterior surface than the cooler interior surface. In addition, the thermal gradient up the vessel wall from the heated base to the unheated upper body results in greater expansion of the lower part of the vessel relative to the upper part. Under these conditions, the cooler inside surface acts as a restraining force to the vertical and horizontal expansion of the exterior surface resulting in compressional stresses at the exterior surface of the vessel wall, tensional stresses at the interior surface, and shear stresses vertically within the wall ( Kingery 1955). However, no radial stresses develop because no resistance exists to radial expansion. A variety of compositional and formal design adjustments can improve resistance to to thermal stress or reduce thermal stresses themselves in ceramic cooking pots ( Crandall and Ging 1955; Hasselman 1970; Kingery 1955; Manson 1966; West 1992). Selection of raw materials with low thermal expansion coefficients reduces thermal stresses while using large, platy or fibrous temper improves thermal stress resistance by increasing the resistance to crack growth. Aspects of vessel form and construction techniques that reduce constraints on expansion (such as floating construction, contouring, and reducing thickness) and avoid stress concentrations (such as rounded shapes and homogeneous materials) also improve thermal stress resistance and potentially increase use-life. The existence of conflicts among design choices indicates that no single design maximizes durability in the face of all potential stresses. To assess the impacts on vessel durability and potential use-life of design choices actually made by ancient Pueblo potters, I conducted a set of strength and use-life experiments on a subset of the plain and corrugated vessels employed in the study of manufacture costs and heating effectiveness. I present and evaluate the results of these experiments in the next section. Following the discussion of the use-life experiments, I examine data on gray ware pottery fracture patterns, sherd accumulation rates, and vessel recycling to determine if changes in actual use-life can be detected in the archaeological record. Use-life is a probabilistic concept. A well-designed vessel that is more resistant to the stresses experienced during use has, on average, a greater probability of lasting longer than a poorly designed vessel. However, pot drops and other accidental or chance events can cause a pot to fail well before it would have through normal use alone. In considering the results of the experiments I am about to discuss, I assume that the incidence of accidental failures remained fairly constant through time, and thus did not contribute to any differential use-life between plain and corrugated cooking vessels. My goal is to document and explain how plain and corrugated vessels respond to the mechanical and thermal stresses to which they would have been exposed during cooking, and to assess how any differences may have contributed to use-life probabilities for plain and corrugated vessels. Cooking exposes ceramic pots to mechanical stresses although, as mentioned above, being careful during use and maintenance of the vessel can minimize these stresses. Pressure exerted by the contents of the vessel on the wall is the most constant mechanical stress and the most difficult to mitigate. Impacts can also occur routinely during use, but the frequency and force of these impacts can be reduced through behavioral adjustments. Accidental impacts, the force of which is difficult to control, constitute the most potentially damaging mechanical stress to which ceramic cooking pots, or any ceramic vessel, are subjected. To document how plain and corrugated vessels respond to these kinds of mechanical stresses, I measured the strength of four of the plain (vessels 1, 14, 20, and 22) and four of the corrugated (vessels 3, 4, 9, and 12) replicas. Each of these vessels had been used for a total of eight hours during the heating effectiveness experiments. I employed three different strength measurement techniques, a falling-weight impact test ( Mabry et al. 1988), a pendulum impact test, and a one-ball-on-three-ball biaxial flexure test ( Neupert 1994). I performed these tests at the Laboratory of Traditional Technology, University of Arizona with the able advice and occasional assistance of Mark Neupert and Michael Schiffer. The results of the different strength tests are presented in Tables 17 and 18. In the falling-weight impact test, I set the rim of each vessel on a platform of wet clay arranged so that the falling weight, a 66.7 g steel ball bearing, would strike the center of the base. The first drop of the weight was from 40 cm above the base of the vessel, and the drop height was increased by one cm for each subsequent drop until the vessel failed. For seven of the eight vessels, the falling weight test resulted in a small hole being driven through the base of the pot. In one case (vessel no. 3), rather than producing a small hole, large cracks formed in the vessel wall. This latter failure required substantially more impacts to produce than the small holes. Using the results from the seven comparable tests, the four plain vessels required an average of 10.25 impacts to fail with a standard deviation of 4.72 while the three corrugated vessels required an average of 12.67 impacts with a standard deviation of 4.16. Although the corrugated vessels tend to be slightly more resistant to the stresses of focused impact on the base, the difference is not significant at the .05 level, and thus may result from sampling error particularly given the very small sample size. Another factor that may account for the small difference in strength is the slightly greater basal wall thickness of the corrugated vessels (see Table 15). Table 17. Results of impact strength tests on plain and corrugated vessels used for different amounts of time. The pendulum impact test was performed on the vessels that were still intact after the falling-weight test except for a small hole in the base. To conduct this test, the vessels were suspended by a string tied around the vessel neck and fastened at the other end to an armature set far enough away from a concrete pillar so that the pot would just touch the pillar when suspended freely. The test involved pulling the vessels away from the pillar while maintaining tension on the string, and releasing the pots so that they would swing into the concrete pillar. This was done several times for each vessel from increasingly greater release angles until the pots failed completely. The first drop angle was 10 degrees and I increased the angle by 5 degree increments. During both the falling-weight and pendulum impact tests, I kept notes on the responses to impact displayed by each vessel. The four plain vessels failed at an average drop angle of 36.25 degrees with a standard deviation of 2.5 degrees while the three corrugated vessels failed at an average angle of 45.0 degrees with a standard deviation of 5.0 degrees. Although the sample size may be too small to document strength accurately, the differences are significant at the .05 level. Thus, the corrugated vessels again appear to be slightly stronger with respect to impact-induced stress. The slightly thicker walls of corrugated vessels may be contributing to this difference. Table 18. Results of biaxial flexure strength tests on fragments from plain and corrugated vessels used for different amounts of time. In addition to subtle differences in strength, I also observed a striking difference in how plain and corrugated vessels broke during the pendulum impact tests. The plain pots all failed from cracks that extended from one side of the rim to the other through the base of the pot creating two, fairly symmetrical vessel halves. The corrugated vessels failed in more complex ways, but usually the cracks extended around the circumference of the vessel following coil joins and resulting in a fairly intact base and upper body/neck segments. I have seen both of these characteristic fracture patterns duplicated in ancient plain and corrugated gray ware pottery. The biaxial flexure test was performed on fragments cut with a rock saw from the upper body and base of each of the plain and corrugated vessels included in the use-life experiments. The strength of these pieces, cut to roughly 2 by 2 cm, was measured by breaking them in a compression cage using the ball-on-three-ball biaxial flexure test described by Neupert (1994). In this test, the sherd is placed horizontally, concave surface down, over three balls equally spaced around a 1.27 cm radius circle and a third ball applies a load at .25 mm/sec onto the upper surface of the sherd at the center of the circle. When the sherd breaks, a peak load indicator shows the maximum load applied at failure. I then converted the peak load values to a modulus of rupture (MOR) using the formula presented by Neupert (1994) which standardizes the load data for differences in wall thickness. Figure 40 shows box plots of the MOR data for all measured fragments from vessels with 8 hours of cooking time. The data are grouped by vessel type (plain and corrugated) and vessel part (upper body and base). The corrugated sherds consistently failed at lower MOR values, and a Mann-Whitney U test confirms the statistical significance (p < .001) of the lower strength of corrugated vessel fragments indicating that differences are greater than expected from sampling error alone. Comparing average median MOR values for individual vessels also indicates that the corrugated vessels are slightly, yet significantly (p < .001), weaker than the plain vessels regardless of vessel part. Figure 40. Box plots of the strength (MOR) of upper body and base fragments cut from replica plain and corrugated vessels used for eight hours in cooking experiments. Discrepancies in results between the biaxial flexure tests and the impact tests probably derive from the former controlling for differences in wall thickness, and thus, eliminating it as a factor in strength comparisons. The greater similarity among corrugated and plain vessels in the median values of peak load at failure (Table 18), which does not control for wall thickness, supports this interpretation. If corrugated vessels are mechanically weaker than plain vessels given the same wall thickness as these results suggest, then it is probably the relatively poorer weld between coils and the uneven surface, both of which can concentrate stress, which accounts for the lower resistance of corrugated vessels to mechanical stress. However, because the two sets of tests also measure different aspects of strength ( Neupert 1994), it is also possible that corrugated vessels are more resistant to the stresses created by repeated impacts while plain vessels have greater resistance to the tensile stresses generated during bending. The small sample size and lack of control for wall thickness in the impact tests curtail our ability to explore this possibility further with existing experimental data. As mentioned earlier, cooking produces three principal kinds of thermal stresses within the wall of a vessel: compressional stress at the exterior surface; tensional stress at the interior surface; and shear stress within the vessel wall. The tensional and shear stresses are the most potentially damaging because ceramic materials are relatively weak in the face of these stresses while relatively strong with regard to compressional stress ( Grimshaw 1971). These stresses arise from the differential expansion of the hotter, lower, exterior portion of the vessel relative to the cooler, interior and upper body portions. The period of peak stress in a vessel used for cooking occurs during initial exposure to heat when thermal gradients are most extreme. Heating of the contents reduces the thermal gradient through the wall somewhat, but because the peak temperature of food mixed with water is relatively low (~100 ¡C), fairly intense thermal gradients, and thus thermal stresses, continue throughout the duration of the cooking episode. Strain, which in brittle ceramics is frequently permanent in the form of cracks, is one undesirable way of alleviating thermal stress in the vessel wall. Cracking that does not lead to the catastrophic failure of the vessel can still reduce use-life through weakening of the vessel wall thereby increasing its susceptibility to mechanical stresses, and by degrading heating effectiveness through increasing the amount of irregularities in the vessel wall which can inhibit heat transfer. However, corrugated pottery, as well as other pottery with a textured exterior surface, may extend vessel use-life by altering the nature of stresses and strains within the vessel wall as some have argued ( Heidke and Elson 1988; Schiffer et al. 1994). If true, the most likely mechanism is the reduction of stress rather than increased stress resistance. An uneven, undulating exterior surface such as produced with corrugation, although possibly acting to concentrate stress, also allows expansion to occur in the exterior portion of the wall, and thus, potentially generates considerably less stress than a plain surface. This phenomenon is analogous to grooves placed in the upper surface of concrete slabs exposed to the sun. These grooves allow expansion to occur in the surface heated by the sun without producing as much compressional stress that might cause buckling of the slab. In the case of corrugated pottery, the relatively poor weld between adjacent overlapping coils, which appears to reduce mechanical strength, may also alleviate thermal stress by allowing expansion to occur along these planes analogous to the floating construction used in many bridges today. Both of these mechanisms potentially serve to reduce the constraint on lateral (vertical and horizontal) expansion that results in the buildup of thermal stress in a cooking pot. In addition, the undulating surface of corrugated vessels may alter the distribution of stresses at the surface where compressive stresses are at their maximum ( Singh et al. 1996). To measure the responses of plain and corrugated pottery to prolonged exposure to thermal stress, I selected eight vessels (four plain and four corrugated) from among the replicas used to cook mush in the heating effectiveness experiments, and used these vessels for extended periods. The experimental protocol was the same as the heating effectiveness experiments except cooking continued for several hours at a time and thus more water had to be added periodically so they did not cook dry. Temperature data were only recorded until the contents of each pot had boiled. After each day of cooking, I examined the pots visually, and carefully squeezed, poked, and tapped them to expose any degradation such as cracks, spalls, pits. Periodically during the use-life experimental runs, I performed the same vessel wall permeability measurements as I had during the heating effectiveness experiments. The goal of the experiment was to cook in all eight pots until they failed resulting in an average use-life estimate for each vessel type. However, after a little more than 600 hours of cooking in one set of four pots (vessel nos. 2, 8, 13, and 19) and 300 hours of cooking in the other set (vessel nos. 10, 15, 21, and 24), only two vessels had failed. Consequently, I decided to forgo using each vessel until it failed. Instead, I attempted to gauge potential use-life differences by observing the development of flaws and failures during use, measuring the residual strength of the intact vessels with impact and biaxial flexure tests, and tracking changes in heating effectiveness over the course of the experiments. Flaws and Failures from Use. I observed two kinds of physical alterations that occurred in the vessels as a consequence of use-pitting and cracking. No spalling such as that described by Schiffer et al. (1994) occurred during the cooking experiments. Pitting consists of the loss of small amounts of pottery from the interior surface of the base of a pot, and closely resembles pitting observed on the interior surface of ancient gray ware pottery from the Mesa Verde region (see discussion of use-alterations in Chapter 6). The pieces removed are not really spalls, but rather are flakes or slivers of the interior vessel surface. Using observations from the heating effectiveness and use-life runs, only seven of the 24 replica vessels developed interior basal pitting. For all but one of the pitted vessels, pitting occurred and reached its maximum extent within the first few hours of use. Of the seven vessels with pitting, all were used to cook mush, two were lined with pinyon pitch, and five have plain exteriors (Table 19). It seems likely that pitting results from tensional stresses on the interior surface that cause a network of short, very shallow cracks to develop which creates enough surface weakness to allow attrition of the surface to occur. The restriction of pitting to the lower portions of the vessel where tensional stresses would be greatest lends support to this interpretation. The correlation between cooking mush and pitting also suggests that there may also be a chemical component to pitting, or that reduced vessel wall permeability encourages pitting. Finally, although the sample size is extremely small, the preponderance of pitted vessels with plain exteriors (71 percent) suggests that plain vessels are more susceptible to pitting. If interior tensional stresses are the main cause of basal pitting and more stress develops within the wall of plain vessels than corrugated, this would explain why more pitting occurred on the plain cooking pots. Table 19. Frequency of replica vessels with pitted interior basal surface after use in experiments by factor combination. None of the 24 vessels used in the heating effectiveness experiment developed cracks during the combined eight hours of use in those experimental runs. However, the extended exposure to thermal stress during the use-life experiment produced cracking in five of the eight vessels. These included all four plain vessels (vessel nos. 13, 15, 19, and 21) and one corrugated vessel (vessel no. 2), and resulted in the complete failure of two of the plain vessels (vessel nos. 15 and 19). No corrugated vessels failed during the use-life experiment. 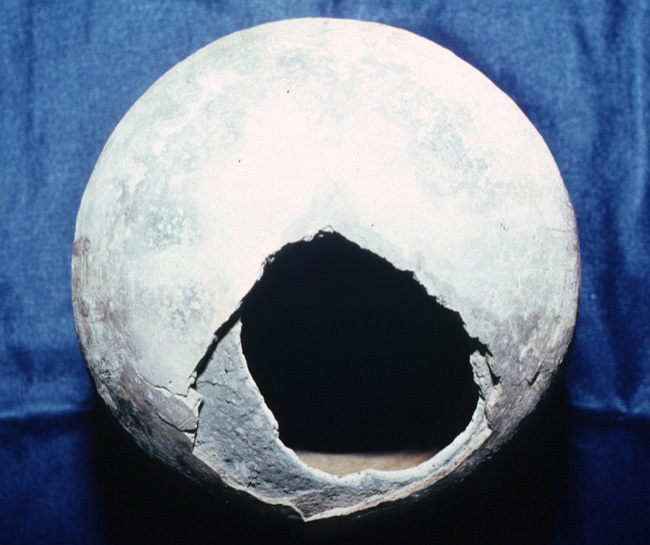 In both cases of complete failure, light pressure on the inside surface produced a pie wedge-shaped hole in the base after cracks had caused significant weakening of the vessel wall (Figure 41). Vessel number 15 failed after 287 hours of use while vessel number 19 failed at the end of the last run of the experiment after 620 hours of use. The first cracks appeared on Vessel 15 after 47 hours of use and on Vessel 19 after 100 hours of use. Among the three other vessels that developed visible cracks but did not fail completely, the first cracks appeared in vessel numbers 2 and 13 after almost 80 hours of use while it took almost 215 hours for cracks to first appear in vessel number 21. The remaining three vessels included in the use-life runs, all corrugated, remained visually intact throughout the experiment. Figure 41. Photograph of vessel 15 failure. In the four plain vessels, cracks appeared first on the exterior surface about 2.5 to 3 cm up from the very base of the vessel. These cracks initially spread in a narrow band horizontally around the circumference of the vessel as a network or web of short, interconnected, hairline fractures. Radial separation along some of the cracks in this horizontal band indicated clearly that the cracks extended into the vessel wall at a very shallow angle. In the two vessels that failed, cracks also extended down from this band of fractures toward the base. Eventually, these vertical cracks extended perpendicularly all the way through the wall. It was along these vertical cracks that failure ultimately occurred producing the pie wedge-shaped holes shown in Figure 41. When the pots did fail, the network of shallow angle fractures resulted in numerous pieces missing some or all of one or both surfaces (Figure 42). These fragments closely resemble the alteration identified as spalling in the six gray ware collections discussed in Chapter 6. Cracks did eventually appear on the interior surface of some, but not all, of the plain vessels. These interior cracks always developed in the very base of the vessel, both as linear cracks across the base and circular cracks around the base, located well below the level of the band of horizontal cracks on the exterior surface. In the single corrugated vessel to develop cracks, interior surface cracks appeared first followed almost 50 use-hours later by the appearance of horizontal cracks on the exterior surface at the same height above the base as occurred with the plain vessels. Figure 42. 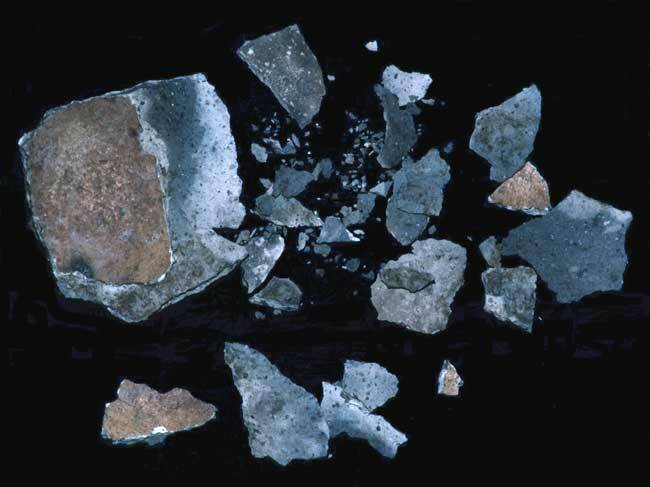 Photograph of fragments produced when vessel 15 failed. The rate and extent of visible crack propagation varied considerably among vessels, and given the extremely small sample size, it would be imprudent to generalize about these particular aspects of cracking at this time. However, an explanation of the consistent pattern of crack development does seem warranted. Two thermal gradients exist within the vessel wall during use, and these gradients generate most of the thermal stress. One gradient extends through the wall between the heated exterior and the cooler interior, and the other extends up the vessel wall from the heated base to the cooler upper body. Figure 43 shows the average temperatures of the exterior and interior1 surfaces along a vertical profile of a replica vessel during use. Interior surface temperatures were not measured directly. Instead, I used the temperature of the liquid contents as a measure of inside surface temperature. For the lower portion of the vessel that was always in contact with liquid, this provides an reasonably accurate estimate of interior surface temperature, although the actual temperature would be slightly higher. For the upper portion of the vessel, interior surface temperature would have fluctuated as the level of the contents fluctuated resulting in periods of exposure to the air. The difference between the interior and exterior surface temperatures at a given position on the vessel wall indicates the intensity of the thermal gradient through the wall, while exterior temperature differences vertically show the gradient up the wall. Compressive exterior and tensile interior stresses would be greatest at the bottom of the pot where the thermal gradient through the vessel wall is the most extreme. Shear stress within the vessel wall would be most intense in the area of greatest change in exterior surface temperature. This is because the cooler interior surface acts as a constant constraining force on the vertical and horizontal expansion of the entire exterior of the vessel wall while, at the same time, the hotter basal portions of the exterior need to expand more than the cooler upper portions. Consequently, rapid change in exterior surface temperature creates a situation in which the hotter portions of the wall are being thrust into the cooler portions because of the differential expansion. The low angle fractures produced by shear stress within the vessel wall appear on the exterior surface as a horizontal band of cracks at the upper edge of the zone of greatest vertical temperature change, and extend down through this zone of intense shear stress (Figure 43). It is not surprising that these cracks would be the first to appear given the relative weakness of ceramics in the face of shear stress. Ultimately, combined shear and tensile stresses cause cracks to extend through the vessel wall leading the failure of the vessel. The lower incidence and slightly different pattern of development of flaws and failures in corrugated vessels support the notion discussed above that the corrugated surface reduces thermal stress by relaxing constraint on the expansion of the exterior surface. However, this advantage would only accrue to vessels for which the base and lower body are corrugated. Neck-banding would not improve the use-life of ceramic cooking pots. Figure 43. Vertical profiles of exterior and interior vessel wall temperatures on replica vessels during cooking experiments. Error bars show the standard error of the mean temperature obtained from multiple measurements. Residual Strength. For the vessels that did not fail during the extended use-life experiments, I performed falling-weight, pendulum, and biaxial flexure strength tests to determine if any differences exist between plain and corrugated vessels in the amount of strength lost over different use intervals. The vessel sample for these strength tests includes two corrugated and one plain used for 600 hours (vessel nos. 2, 8, and 13 respectively), and two corrugated and one plain used for 300 hours (vessel nos. 10, 24, and 21 respectively). This extremely small sample produced ambiguous results (Tables 17 and 18). In the falling-weight impact test, two of the corrugated (vessel nos. 2 and 24) and both of the plain vessels cracked while the other two corrugated vessels developed small holes. Of the two corrugated vessels that cracked, the vessel used for 300 hours required 63 drops of the ball bearing to fail while the vessel used for 600 failed after only 18 drops. The single corrugated vessel used for 8 hours, which cracked during the falling-weight test of mechanical stress resistance, required 55 drops to fail. Of the two corrugated vessels that developed holes, the vessel used for 300 hours failed after 13 drops and the vessel used for 600 hours failed after 3 drops. The three corrugated vessels used for eight hours discussed earlier which also developed holes failed after an average of 13 drops. Thus, it appears that for corrugated vessels there is little or no strength reduction between eight and 300 hours of use, but 70 percent to 75 percent of strength is lost between 300 and 600 hours of use. For the two plain vessels, the vessel used for 300 hours required 16 drops to fail while the vessel used for 600 hours failed after 46 drops. This unexpected result may derive from the differences in basal wall thickness between the two vessels (vessel no. 21= 4.7 mm; vessel no. 13 = 5.8 mm), or possible slight differences in manufacture or firing. Unfortunately, no comparable data exist from plain vessels used for eight hours because all developed holes rather than cracking during the falling-weight test. The only data available from the pendulum impact test is for the corrugated vessels that did not crack during the falling-weight test. The vessel used for 300 hours failed when dropped from an angle of 45 degrees and the vessel used for 600 hours failed when dropped from 40 degrees. The average drop angle for the vessels used for eight hours was 45 degrees. Biaxial flexure tests on pieces cut from the six vessels that survived the cooking phase of the use-life experiment are equally ambiguous (Table 18). A box plot of MOR values for sherds cut from the base of the plain and corrugated vessels used for different lengths of time shows that the strength of corrugated vessels remained fairly constant while the strength of plain pottery appears to increase across the three use-life intervals (Figure 44). To control for differences in original strength of the vessels, I computed a ratio of median MOR of the base sherds to the median MOR of the upper body sherds for each vessel. Figure 45 shows that these ratios generally vary little across different use intervals and most of the values are not significantly different from 1.0. This indicates that the strength of base pieces did not degrade significantly over use-life relative to upper body pieces. This result is difficult to explain and probably results from trying to use an extremely small sample to measure a complex phenomenon. However, it is possible that the development of cracks reduces stress and strain locally so that areas in between cracks retain their original strength while the overall strength of the vessel degrades. Figure 44. Box plot of strength (MOR) of base fragments cut from replica plain and corrugated vessels used for different amounts of time in cooking experiments. Figure 45. Ratios of median base to median upper body strength (MOR) values for plain and corrugated replicas used for different amounts of time in cooking experiments. Effective Use-Life. The development of subcritical fractures in the vessel wall of a cooking pot can degrade its heat transfer effectiveness by introducing voids that impede heat flow. It is possible then, that through use, a vessel could become so ineffective that it is no longer practical for it to continue serving as a cooking pot although the vessel remains physically intact. Thus, the effective use-life of a cooking pot might be shorter than its use-life as determined by structural integrity. Figure 46 shows the heating effectiveness (time to reach peak temperature) over the cumulative hours of cooking use to which the vessels were exposed. Although some variation exists among vessels and between runs of the same vessel, Lowess trend lines for both plain and corrugated vessels show that heating effectiveness remained fairly constant over the period for which these vessel were used. Because two of the plain pots failed during this experiment, it appears that the structural use-life of plain vessels is shorter than the effective use-life. Because none of the corrugated vessels failed, it is still possible that corrugated vessels could remain structurally intact beyond the point at which they are no longer effective cooking pots. An experiment involving many more hours of use would have to be conducted to determine if this is the case. Figure 46. Scatter plot of the heating effectiveness of plain and corrugated vessels over experimental use-life with Lowess best-fit lines for each vessel type. If the different responses of plain and corrugated vessels to mechanical and thermal stresses had an effect on vessel use-life, these differences should have left traces in the archaeological record. In this section, I examine evidence from the Mesa Verde region on fracture patterns, accumulation rates, and vessel recycling in plain and corrugated gray ware pottery. Patterns in these data appear to reflect, at least in part, differences in actual vessel durability and use-life. In analyzing the six gray ware assemblages from the Mesa Verde region, I recorded the fracture pattern (random, cubic, or stepped) for each sherd. Nonrandom fractures frequently result from cracks following the joins between coils particularly in pottery with exposed coils. The mechanical stress experiments discussed earlier in this chapter indicate that corrugated pottery produced with overlapped and indented coils is slightly weaker than pottery in which the coils are scraped smooth. If this is true, then corrugated pottery should produce more nonrandom fractures than plain pottery. In addition, ancient Pueblo potters employed a wide variety of techniques to produce pottery with exposed coils and the relative frequency of these techniques changed through time (see Chapter 5). To the extent that the degree for overlapping of adjacent coils and use of indenting affects strength, pottery that vary in these qualities should display different amounts of nonrandom fractures. Table 20 shows the abundance of sherds with random and nonrandom fractures in three categories of pottery with exposed coils and scraped plain pottery. The greatest relative frequency of nonrandom fractures, 84 percent, occurs in the earliest form of exposed coils, those lacking overlapping and indentations. The use of overlapping without indentations decreases the amount of nonrandom fractures to 75 percent, and the addition of indentations to overlapped coils to produce corrugated pottery results in a further decline in the relative abundance of nonrandom fracture to only 60 percent. Scraped plain pottery produced only 20 percent nonrandom fractures. Thus, it appear that the mechanical strength of exposed coil pottery increased through time with the additions of overlapping and indenting of coils, and none of the exposed coil forms appears to be as strong as scraped plain pottery. However, the difference between corrugated and plain pottery is probably exaggerated in the fracture pattern data because of the use of large coils or slabs to construct early plain pottery and the existence of few sherds large enough to break nonrandomly along the widely-spaced coil joins (see Chapter 5). Not only do these results support the conclusions reached in the mechanical stress experiments, but also they have implications for the importance of strength as a factor in the development of full-body corrugation. The extension of exposed coils to cover the entire exterior surface of vessels only after the adoption of overlapping and indenting probably relates to the improvements in strength provided by these innovations. Table 20. Fracture pattern data for different classes of exposed coils and scraped plain pottery in the six utility ware assemblages from the Mesa Verde region. 1The nonrandom category includes both cubic and stepped fractures. A variety of factors determine how much of a given artifact class accumulates in a particular archaeological deposit including duration of the accumulation episode, the number of people involved, and the rate of artifact discard ( Schiffer 1987:47-58). For cooking pots, the discard rate depends primarily on the kind and intensity of use, and vessel durability or use-life ( Varien and Mills 1997). Consequently, it may be possible to detect changes in cooking pot use-life if the other factors affecting accumulation rates can be controlled. Using simulation to assess the affects of various factors on discard rates, Varien and Potter (1997) found that the longer the occupation and the larger the population, the more stable and predictable discard rates become. Nelson, Kohler, and Kintigh (1994) also document that in probabilistically recovered samples from habitation sites in the Dolores River valley, a strong linear relationship exists between the quantities of various artifact classes suggesting that absolute accumulation rates were determined primarily by the occupation length and population size. Thus, comparing assemblages using a ratio of gray ware pottery to another common artifact class, as I did in Chapter 6 with as stone chipping debris (debitage), should control for length of occupation and population size as long as the occupations were long enough and similar activities were performed. The upper graph in Figure 20 (in Chapter 6) shows that the accumulation rate of gray utility wares decreased dramatically in the Mesa Verde region after the adoption of full-body corrugation. Although the number of assemblages for which the ratio could be calculated is small because few reports provide data on the weight of pottery, the pattern fits that expected if corrugated vessels were more durable. If gray ware cooking pots remained more or less structurally intact after their performance in cooking had deteriorated to point of being no longer effective, these vessels could have been recycled into other uses that would not involve too much mechanical stress. The recovery contexts of gray ware vessels provide some evidence for vessel recycling and possible differences in use-life between plain to fully corrugated vessels. In structures dating to after AD 1000 across much of the northern Southwest, corrugated vessels were buried in the floor up to their neck or rim and covered with a stone or pottery lid. Although these vessel presumably served as domestic, indoor storage space, they usually have soot accumulations and other evidence of having been used in cooking as well ( Mills 1989:154-155; Renken 1993; Rohn 1971). Because they could not have been used to cook while buried in a floor, they must have been used in cooking earlier and were then recycled for use in storage. Although this is a common recovery context for corrugated vessels, I know of no examples of similar treatment of plain or neck-banded gray wares. This may indicate that not only were corrugated vessel more durable than plain vessels as cooking pots, but that the structural use-life corrugated vessels was often longer than their effective use-life. It is also possible that the use of vessels to line subfloor storage pits was an innovation that just happened to coincide with the adoption of full-body corrugation and no causal relationship involving vessel use-life exists between the two. More extended use-life experiments are required to address this issue. I investigated four engineering properties of plain and corrugated vessels-manufacture costs, heating effectiveness, ease of handling, and use-life-mostly through controlled experiments, but also drawing on physical theory, data from ancient pottery collections, and anecdotal experiences when appropriate. In some cases, these investigations have yielded new insights into the functional aspects of the corrugation problem, while in others, they have supported earlier views and reinforced their theoretical and empirical justifications. However, in all cases, I found cost or performance differences to exist between plain and corrugated vessels. For manufacturing costs, I found that the full-body corrugated vessels were considerably more time consuming, and thus more costly, to form than the early plain vessels. The principal determinant of this cost difference is the size and application technique of the coils. Vessels constructed with narrow, substantially overlapped coils are more costly to form than vessels made with large filleted, or nonoverlapped, coils. Consequently, I infer from this that as the size of coils decreased and the amount of overlapping application increased through time, the manufacture cost of Puebloan cooking pots increased as well. I examined two aspects of heating effectiveness: heat transfer and cooking control. Regarding the heat transfer properties of plain and corrugated vessels, my experiments demonstrate beyond any doubt that corrugation substantially degrades net heat transfer effectiveness unless vessel walls are made impermeable. Although the corrugated exterior surface does improve heat transfer rates, this is true for heat entering and leaving the vessel. Because the heated portion of the vessel is usually smaller than the unheated portion, substantial heat loss can occur from the unheated surface. This upper body heat loss significantly degrades performance as liquid soaks through the vessel wall resulting in evaporative cooling, and there is a greater surface area from which heat loss can occur. When the permeability of the vessel wall is minimal, which fortunately occurs as a consequence of cooking food, this limits evaporative cooling and greatly reduces upper body heat loss. Under these conditions of normal use, the heating performance of corrugated vessels is only slightly less than that of plain vessels. This supports and extends earlier studies that had undermined the dogma of improved heat transfer effectiveness of corrugated vessels because of the extended exterior surface. However, it also appears that the slightly degraded heat transfer performance of corrugated vessels has an additional benefit of improving cooking control through a considerable reduction in boilovers. This improved cooking control would have appeared as exposed coils began to be used below the neck of vessels, and would have increased as more and more of the upper body surface was covered with corrugation. Although most of my data on ease of handling are anecdotal, it does appear that a corrugated surface improves handling particularly when the vessels are hot. This improvement comes mainly from the increased surface roughness of corrugation which both increases friction and reduces amount of hot vessel wall coming in direct contact with hands. Consequently, innovations that increased surface roughness, such as overlapping and indenting coils, would have improved the graspability of cooking pots particularly when these techniques were employed on the necks of vessels. Finally, corrugation does improve the probable use-life of cooking pots, but only if the corrugations occur on the base of the vessel. This improvement comes mainly from a reduction in the amount of thermal stress generated in the vessel wall during use. Thermal gradients produced both through and up the vessel wall during use in cooking result in a greater expansion of the exterior base in relation to other parts of the vessel. Although the use of corrugation reduces the mechanical strength of the wall, the uneven surface also creates room for the differential expansion of the base to occur without producing as much stress as in a plain, or smooth-surfaced vessel. Unfortunately, I could not quantify the difference in probable use-life with my experiments, but data on the accumulation rates of gray ware pottery in the Mesa Verde region indicate that the introduction of full-body corrugation may have substantially improved the use-life of these cooking pots.